Unishio has an amazing sea fragrance and sweetness that comes solely from the sea urchin, and makes a unique and delicious seasoning. Osashimi of squid sprinkle Unishio. Osashimi is Japanese food to eating raw. Also paired with pasta or tempura is an excellent use of Unishio. Unishio is made from the extract of sea urchins obtain from making Shiouni. Shiouni is considered one of the top three delicacies in Japan. Our company “Tentatsu” was established in 1804, the first year of Bunka, and it was an exclusive merchant of products here in Echizen, Fukui. The 3rd generation owner of our company, Gohei Amano, obeyed an order from the feudal load of Fukui, Haruyoshi Matsudaira to produce a preserved food using sea urchins that could be carried by soldiers during the war. Then Gohei discovered the process of preserving the sea urchins with salt using the “salted method(塩蔵法)”. Afterward, the method was passed down through the generations and spread along the seashore in Fukui. To make Shiouni, first we sprinkle salt on sea urchins to draw out of sea urchin moisture. Once the moisture has been drawn out, the sea urchin is fermented. Shiouni is unique food to Fukui Japan. During the Edo period, the general public could not eat our product. It was used as a tribute for the House of Tokugawa, the other feudal load, and the imperial family. Then it spread through the feudal load of the whole country. The extract we obtain from the sea urchins is called Unishio, and is used dy the general public as a luxurious seasoning. It is good to sprinkle Unishio on hot rice as the taste of sea urchin and smell of the sea will stir up ane appetite. Also paired with pasta or tempura is an excellent use of Unishio. If you fancy Japanese sake, we recommend trying Unishio while you drink. 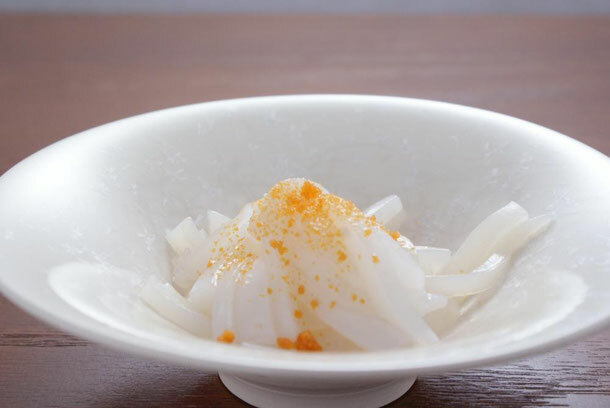 Unishio is a unique and luxurious sea urchin seasoning in Fukui that is too good to pass up.